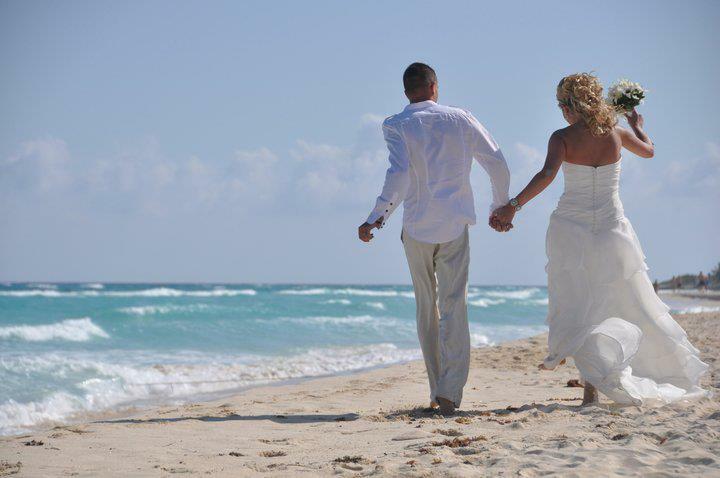 Grand Velas Riviera Maya, The wedding of your dreams is a reality at Grand Velas Riviera Maya. 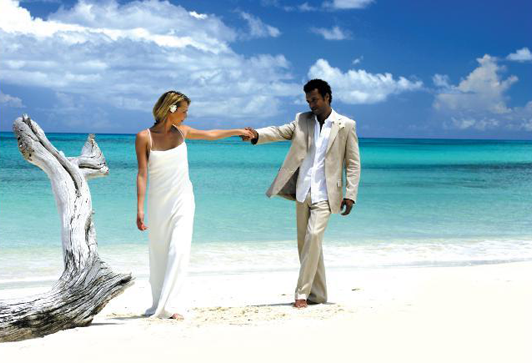 Dramatic scenery composed of white sand beaches, deep lush green tropical jungle and azure Caribbean waters creates the romantic backdrop you have always imagined for your special day. Our professional wedding coordinators can help you design your event; from an intimate sunset beach ceremony beneath an altar dripping with flowers to chic garden reception to a lavish ballroom affair for hundreds of guests. Add our gourmet catering and your choice of wow factors like live music, performers, beach lounge areas and more, and you’re ready to get married in style. The Royal Playa del Carmen, The Resort boasts a perfect beachfront location, mere steps from Playa del Carmen’s famed Fifth Avenue, with its hip night spots, trendy cafes, colorful shops and local color while experiencing THE Royal’s flawless hospitality. The resort’s interior is as impressive as its palatial exterior, where the use of textures, fabrics and natural materials reflects sophisticated seaside grace. The richness of the extra spacious suites (many of which are ocean view or oceanfront), the exquisite furniture, handcrafted by local artisans, the spacious marble bathrooms and furnished terraces, plus an array of unique and exceptional guest amenities assure an experience that goes beyond luxury for discerning guests. 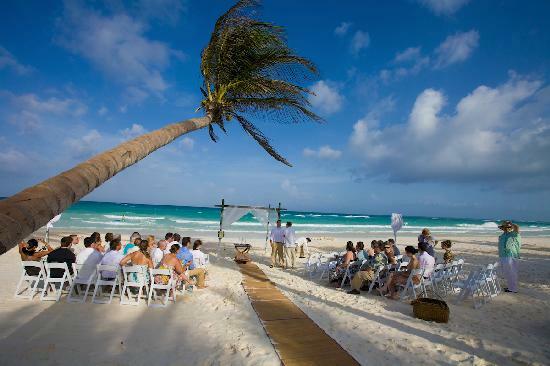 Ana & Jose, imagine your dream wedding on the beaches of Tulum, in the Riviera Maya, bathed by the morning sun, at sunset time or under the stars. Our chef’s will surprise you with Caribbean seafood specialties and Mayan exotic traditions. Enjoy this special day while overlooking at our turquoise blue waters standing on white sandy beaches lit with tiki torches and mystical candles. Zulum Beach Club and Cabanas; located on the stunning beaches of Tulum. The hotel has its version of traditional Mayan weddings. The Mayan wedding here is performed only in the king beach-front rooms, and it is a Mayan ritual with a Shaman. A 3-night package includes breakfast in bed, one hour of romantic live music on the terrace during the first night, one hour of live mariachi music on the beach front deck during the last night, dinner on the beach deck, champagne tour to a private island, butterfly liberation ceremony and 5-hour tour through the most beautiful parts of the region. Mestizo Hotel Boutique Tulum; We count at La Casa del Mestio with seven rooms, a restaurant and a good extension of areas for events Anniversaries, Weddings, Productions and yoga retreats. El Mestizo Hotel Boutique Hotel counts with thirty rooms in different modalities, which is a complement of La Casa del Mestizo. By staying at our hotel, your customers can get intimate with the gifts of nature, like clear water, the vast white sand beach, the second largest reef in the world and fauna Sian Kan Biosphere, and the major archaeological sites of Mayan culture. Xel-Ha ; is a water theme park in the Riviera Maya “created by Mayan gods” and its weddings packages offer some of the most romantic scenes in the Caribbean. The Mayan Ceremony includes a natural setting by the azure Caribbean sea, cocktails, dinner and couple’s massage. Xcaret ; Nestled among the rainforests and upon the turquoise sea, Xcaret is a Mayan eco-park that offers non-traditional wedding ceremonies. Couples can get married in a St. Francis of Assisi Chapel; by natural, rocky ponds and a stone altar; in the middle of the jungle and other unusual locations. After-wedding reception can include performers, singers, actors and dancers, dinner at restaurants with magnificent views offering traditional Mexican and other cuisines and after-dinner party with a DJ. Sandos Caracol Eco Resort & Spa; Picture yourself experiencing a lifetime moment surrounded by the ocean breeze and soft white sand, with the most spectacular Mexican Caribbean Sea view at the Riviera Maya. 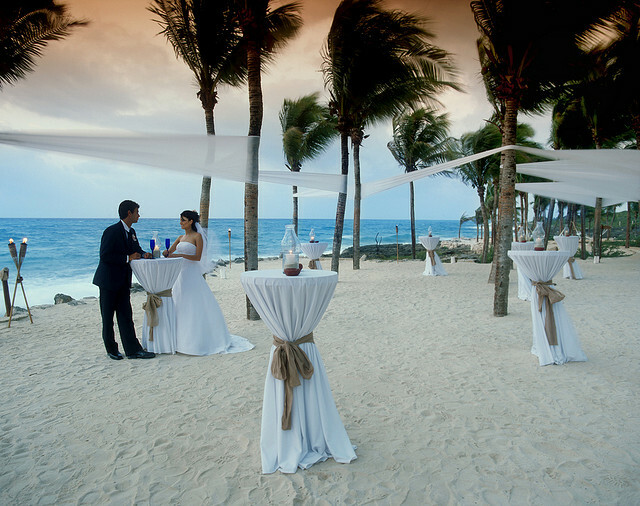 Live your dreamlike wedding at Sandos Caracol Eco Resort & Spa. Hacienda Tres Rios; provides the perfect environment for special events with ballroom capacity of up to 560 people in its sophisticated, luxurious setting. Our deluxe facilities surrounded by a natural tropical paradise with mystical overtones of Mayan history, provide a unique environment and experience that will be remembered and valued for years to come. Esta entrada fue publicada en Budget vacations to playa del carmen, Cancun, Luxury Vacations in Playa del Carmen, mayan archeology, mayan ruins, Mexico, Riviera Maya, Romantic Vacations, Travel, Tulum, Weddings in Mexico y etiquetada beach weddings, bride, Caribbean weddings, décor, destination weddings, flowers, getting married in mexico, groom, mayan weddings, romantic weddings, wedding designer, wedding photographers, wedding planner, weddingdecor, Weddings, weddings at ana y jose Tulum, weddings at grand velas Riviera maya, weddings at hotel akumal caribe, weddings at iberostar paraiso lindo, weddings at iberostar paraiso maya, weddings at mahekal resort playa del Carmen, weddings at mayakoba, weddings at Mestizo Tulum, weddings at sandos caracol weddings at hacienda tres rios, weddings at sandos Playacar, weddings at the reef Playacar, weddings at the royal playa del Carmen, weddings at xcaret, weddings at xel ha, weddings at Zulum beach Tulum, weddings in mexico, weddings in playa del Carmen, weddings Tulum, weddings with mayan explore. Guarda el enlace permanente. Nice =) keep it up guys! !